If you are a vegan and have to take medications for pain, you may often become doubtful about whether the ingredients of the medications are really plant-based. As we know, most of the ingredients of branded medications are synthesized in the laboratory from animals. But when pain takes over, you are helpless and have to take whatever medication is available. But, not anymore! Now a surefire remedy has made its entry in the pain reliever market – it’s the Turmeric Curcumin for pain reliever by Vitboost! You’ll be amazed to see its efficacy in any kind of pain, whether it’s arthritic joint pain or any other pain. Do you know its ingredients? They are easily found in our kitchens – turmeric and black pepper! Curcumin is the main active ingredient in turmeric and known to relieve joint pain and inflammation with its powerful anti-inflammatory and antioxidant effects. However, the bad news is that the absorption of curcumin in the body is very poor. So, what can be done? 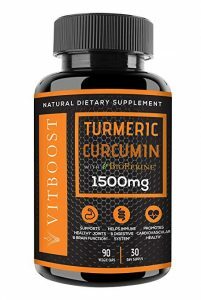 Well, there’s a simple solution as found by Vitboost – to combine it with bioperine extracted from black pepper, which increases curcumin’s absorption in the body by a whopping 2,000%. Since both turmeric and black pepper are plant-based, you don’t have to worry about breaching your veganism. Both these ingredients together can give you incredible results in pain. The problem in question here is inflammation and pain. But you’ll be surprised to know that both are important for you because without them, you wouldn’t have known about any problem and entry of pathogens in your body. However, when both these get chronic, they need to be treated and here Turmeric Curcumin with Bioperine is the safest remedy because it comes from natural sources and have no side effects. As an anti-inflammatory substance, curcumin is so powerful that its efficacy matches that of some anti-inflammatory drugs. It blocks the NF-kB, a molecule that enters the nuclei of your cells and activates genes associated to pain. NF-kB is considered to have an important role in several chronic diseases. Curcumin is a potent antioxidant too and hence addresses the oxidative damage too, one of the main mechanisms responsible for aging and several diseases. Curcumin effectively neutralizes free radicals because of its particular chemical structure. Thus, curcumin protects body from pain and inflammation with a dual action – anti-inflammatory and antioxidant. Bioperine helps in this by maximizing curcumin’s absorption. So, you don’t have to worry anymore about getting a vegan pain medication because Turmeric Curcumin extract supplement capsules for the 100% vegan by Vitboost are now available.